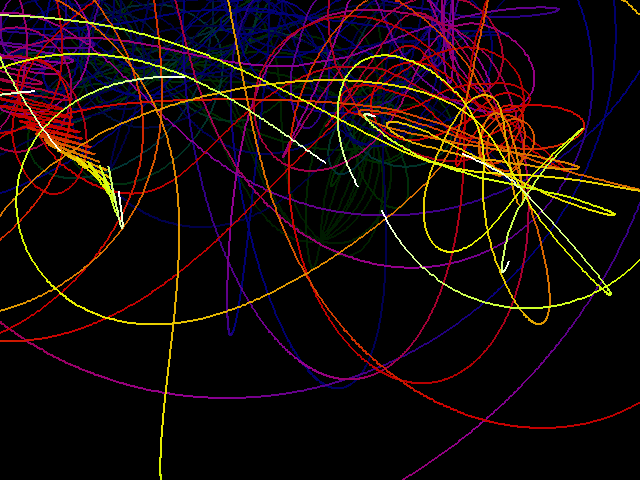 I was inspired recently to write a computer program which draws pretty images. Here are a few screenshots. 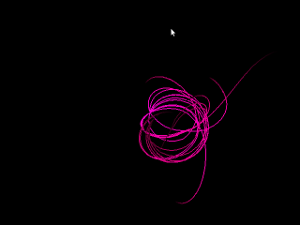 Screenshot of swirls.py showing purple swirls. 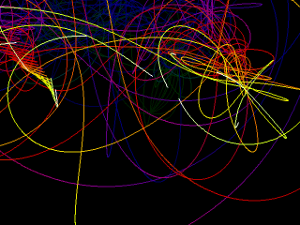 Screenshot of swirls.py showing many rainbow-coloured swirls. 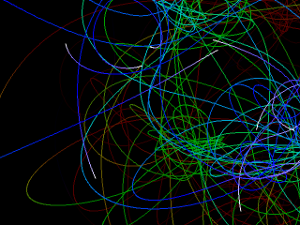 Screenshot of swirls.py, featuring mostly blue and green swirls. You will need to have python and pygame installed to run the script. There are invisible “singularities” drifting around the screen (you can make them visible by replacing SINGULARITY.VISIBLE = False with SINGULARITY.VISIBLE = True in the code). There are a fixed number of flares, which actually do the drawing. The flares are affected by gravitational effects from the singularities. At any given point in time, every flare is leaving a trail of the same colour. Over time, the colour cycles through the various colours. To prevent slingshot effects being too extreme, there is a radius around each singularity within which flares don’t feel any gravity from that singularity. Singularities cannot leave the screen. If they hit an edge, they change directions. Flares can leave the screen, but cannot go more than half the screen’s width or height beyond the screen boundaries. If they do, they reflect back and their velocity is damped. While the left mouse button is pressed down, the flares feel a gravitational effect towards the mouse pointer, which is twice as strong as the effect of one singularity. 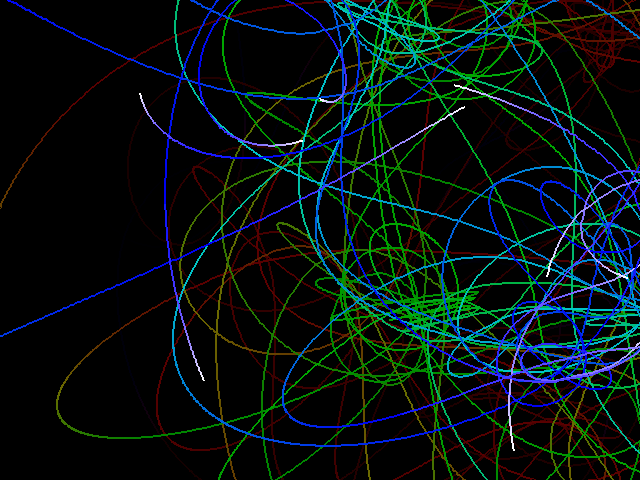 This entry was posted in midlength and tagged art, beauty, colours, pygame, python. Bookmark the permalink.